Nice little stoves. Wish I could understand the language. I may hold the title for smallest low pressure burner. I made one with a tealite container. The fiberglass wick in the center is the primer wick. Would a short wire suspending the pot from above count as a "potstand"? realityguy wrote: Would a short wire suspending the pot from above count as a "potstand"? What..you can't just hang it from your finger? Also..when you say "smallest"..what factors does that include?..diameter?weight?height?capacity?Folded?open?in pack mode?..or all of the above? realityguy wrote: What..you can't just hang it from your finger? I guess you have to start with the definition of a "stove". Otherwise, a thimble full of alcohol could take the title . 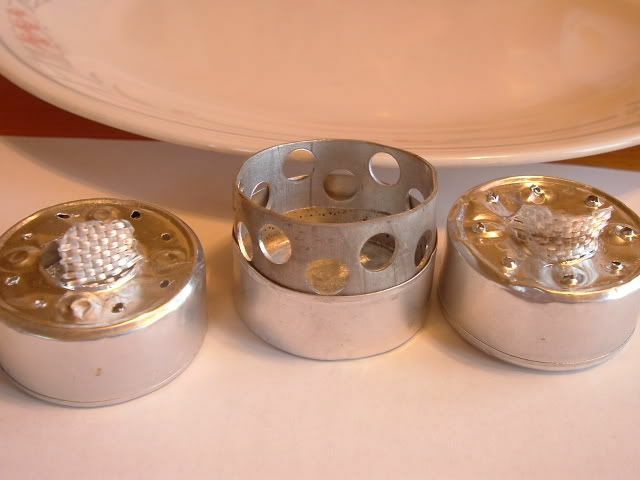 As long as that thimble can boil 16oz of water with 1/2oz..why not.I was playing with a miller lite lid(fits inside a tealite cup..so it is smaller..and some stainless sieve wire for a potstand.Unfortunately the cap's indents around the perimeter are not liquid tight(rats! ).I've got another the same size from a different can..should be liquid-tight.heh..heh..heh..